גוש כסף Engelhard Australia משקל שתי אונקיות Rounded edges give this unique 2 oz silver bar from Engelhard Australia a unique look. 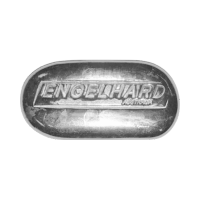 Engelhard Australia was founded by Charles Engelhard Sr in 1920 operating under the name Glover and Goode Limited. In 1958 Glover and Goode was incorporated into Engelhard Industries in America. The U.S. company ceased producing investment bullion decades ago. A visionary in Australia has revived the Engelhard Australia name and is producing some very unique looking silver bars. A low premium way to add an unusually sized cast bar to your stack.